A modular unit is lowered into place at the Second Street Studios project in San Jose. One of San Jose’s largest permanent supportive housing projects is well underway. The Second Street Studios, a five-story, 157K SF modular construction development will create 135 units using 111 modules. The four floors of modular units will make up 89K SF above ground-floor retail and social service space. The development, at 1150 South Second St., is being developed by First Community Housing and was designed by Rob Wellington Quigley. The general contractor is Branagh. 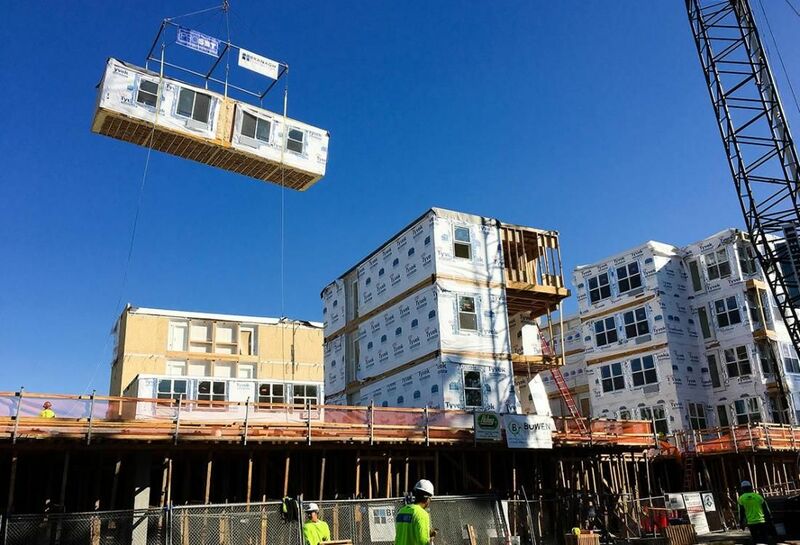 Modular construction is starting to become more popular throughout the Bay Area as a way to provide more affordable housing to seniors, homeless and families faster and cheaper.